Q: US President Donald Trump yesterday suggested that due to China's influence, the DPRK leader Kim Jong-un has taken a harder position against the United States and the ROK ahead of the US-DPRK summit which is supposed to happen next month. How do you respond to this? Has China been influencing the DPRK leader in this regard? A: I have noted relevant reports. We have said many times that China is committed to promoting peace talks and will always play a positive role on the Korean Peninsula issue. At present, the political settlement of the Korean Peninsula issue has come across hard-won historic opportunities. We hope that relevant parties, especially the DPRK and the US, could seize the opportunity, meet each other halfway, and address each other's concerns in a balanced way. We also hope that the DPRK-US meeting will proceed smoothly and achieve positive outcomes. Q: Australian businesses have encountered difficulties amid problems in the China-Australia relations, and the Australian wine exported has been held up at Chinese customs. The Chinese media today urged a ban on Australian wine and beef imports. Is there any directive from the Chinese government for Australian wine exports to be restricted by the customs? How would you characterize the meeting between State Councilor and Foreign Minister Wang Yi and his Australian counterpart Bishop in Argentina recently? A: We usually don't comment on media's opinions. As to the specifics concerning the inspection and clearance of Australian wine at Chinese customs, I would like to refer you to the General Administration of Customs. According to our information at hand, the Chinese customs and the inspection and quarantine department are handling the relevant applications with normal procedures. The relevant departments of the two sides have all along stayed in communication on the relevant issue with each other. The China-Australia relations have recently encountered difficulties, which leads to problems in our cooperation in some areas, and that is something China does not wish to see. Lately, senior Australian officials, including Ms. Bishop herself, have expressed their readiness to improve our bilateral relations and issued some correct statements on China's development. We hope the Australian side will translate the relevant remarks into concrete actions and create necessary conditions for the true improvement and sound and steady development of our ties. As I said yesterday, State Councilor and Foreign Minister Wang Yi clarified on a fundamental and macro level that the Australian side must first of all address its problem of perception, put China's development in a positive perspective and truly take China's development as a positive factor, instead of looking at China through tinted glasses. Once the problem of perception addressed, the necessary conditions for the true improvement and sound and steady development of China-Australia relations will be created. Q: On the night of May 21 Beijing time, US Secretary of State Mike Pompeo announced the administration's new Iran strategy after its pullout from the Joint Comprehensive Plan of Action (JCPOA), requiring negotiations for a new "international treaty" to fully resolve the Iranian issue. Iran responded strongly to the US' new strategy and the international community also voiced different opinions. What is China's position? A: China has noted the US' policy announcement as well as the reactions of other relevant parties of the international community. The practice over the past three years or so has fully proved that the JCPOA is effective. 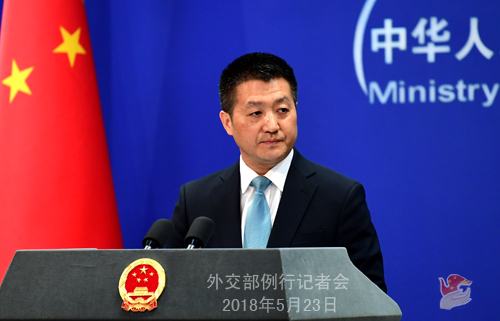 China always believes that ensuring the integrity and sanctity of the JCPOA is conducive to upholding the international non-proliferation regime and promoting peace and stability in the Middle East. We also maintain that ensuring the effective implementation of the agreement will in itself serve as an exemplar for the settlement of other international hot-spot issues. 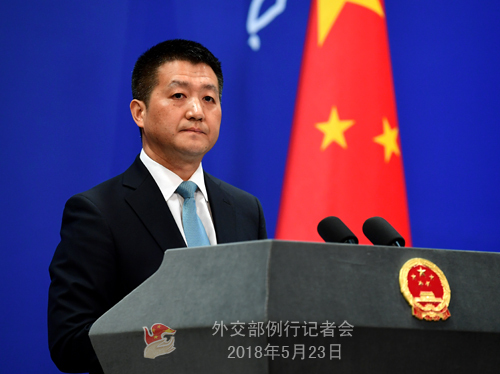 Under the current circumstances, China calls upon all parties to bear the long-term, larger interests in mind, act in a realistic, rational and responsible manner, stick to the correct direction of settlement through diplomatic dialogue and properly manage differences to ensure the ongoing implementation of the JCPOA. On such basis, all parties should stay committed to establishing mutual trust and resolving other issues of their respective concern. China will remain in dialogue and negotiation with all relevant parties and stay committed to upholding and implementing the JCPOA with an objective, impartial and responsible attitude. Q: The summit between the DPRK and the US is set to happen on June 12 in Singapore. Does China have any suggestions on the stance that each side should take in the run-up to and at the time of the summit? What role would China like to play in direct talks between the US and the DPRK? A: China has been encouraging and supporting the US and the DPRK's efforts to accumulate mutual trust through direct dialogues and move forward the political settlement of the Korean Peninsula issue. You may all have noticed that the US and the DPRK are continuing with their preparations for the meeting. We hope that the two sides could seize the opportunity, stick to dialogues, meet each other halfway, remain undisturbed and endeavor to realize their meeting. 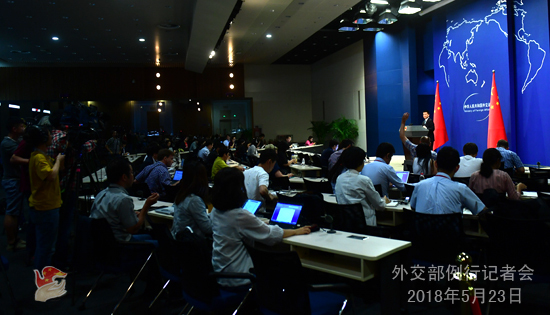 China stands ready to continue playing a part in it.